As someone who probably eats a little too much pizza, I went on the hunt to find the best places in London to try. Putting “London’s Best Pizza Restaurants” into Google bought up lists from the likes of Trip Advisor and Time Out but also “londonsbestpizza.com” which re directs to Santa Maria a small pizzeria in West London. When a place boasts “London’s Best” anything food wise, it just harks back memories of when I first moved here and got completely over whelmed trying to chose where to eat in Brick Lane. With “Brick Lane’s Best Chef 2015” next door to “London’s Best Chef 2014 & 2015” and “Best Indian Food In The World Since 1900” (last one may have been an exaggeration but still, you get the point..) it was so overwhelming I ended up just stopping and going for a trusty Byron Burger. So while I was excited to try a place hailed as London’s Best Pizza, as a big pizza fan I was worried it may not live up to its claim. Just like the size of the restaurant itself, the menu is fairly small. 4 starters, 13 types of pizza, 2 salads and 3 desserts. That’s it. No pasta. No anti pasti. No side dishes. Although wise man once told me, the best places to eat have small menus done well. So I should definitely have known I was in for a treat when I was greeted with an A4 single side of paper, with over a quarter taken up with Santa Maria’s logo. I chose the “Santa Carmela” with ham, mushrooms and parmesan and of course a glass of house white wine. The wine, for being unnamed and house, was lovely. Crisp, fruity, light and of course, Italian. Now, onto the best bit, the pizza! The toppings were plentiful and the base was thin, crispy but still fluffy, and most importantly absolutely delicious. Best of all, the kitchen is fully open so if you’re in the front half of the restaurant you can see it being made, from the dough being hand stretched to it being put in the wood fired oven. So you know everything you order is fresh. The pizzas were a good size, although personally, I struggled to finish it all however it was too good to leave any. While I am not 100% sure I can say without trying all of the pizzerias mentioned on Time Out’s lists that Santa Maria is for sure London’s Best Pizza, what I can say is it is certainly a contender! The quality is absolutely fantastic and with pizza’s starting at £5.50, if you’re in the area, eating authentic Neapolitan Napoli style pizza doesn’t have to break the bank. 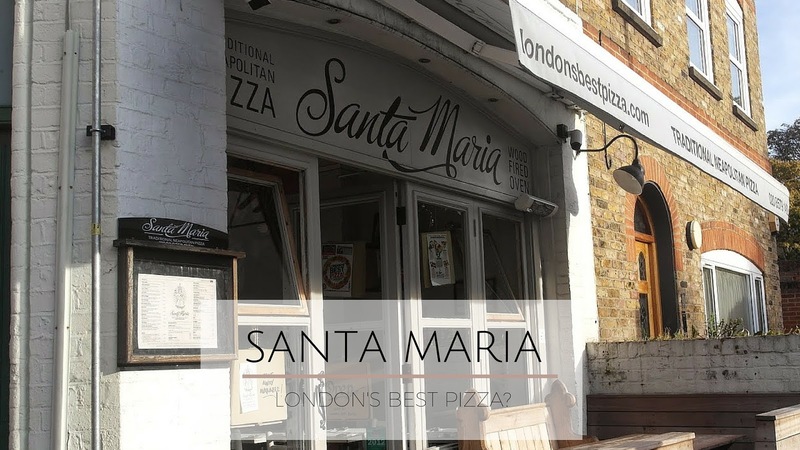 Santa Maria is located on Saint Mary’s Road, Ealing, London, W5 5RA, a short walk from both South Ealing and Ealing Broadway stations. Have you tried Santa Maria before? If not, what’s your favourite place to go for pizza?